I had a mystery flower come up in my garden. In the back of a drawer, I found an old packet of mixed cottage garden seeds, when I was having a tidy. It was way past its' use by date, but I thought I'd give them a go, and sprinkled the whole packet over the garden bed. Just a couple of seedlings came up....and (sadly) only one survived! Not seeing a flower like this before, (I didn't keep the seed packet), I googled 'pink cottage garden flower', and sure enough, after a bit of scrolling, there it was. Apparently, these are found growing among the wheat in Europe. 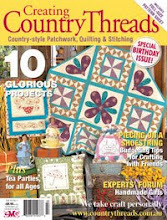 That's me on the front cover of this month's Inspiring Country Threads Magazine! 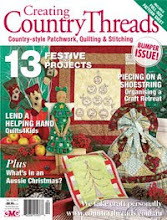 I would like to send out a big thank you to Danielle Tebb (Editor) for all her wonderful advice and encouragement she has given me since I've been contributing to the magazine. She is a delight to work with. And also thanking my gorgeous friend, the very talented Sandrine Marsh of ImageInCafe Styling & Photography for the fabulous portrait shot for my profile. Sandrine has a way of making you feel at ease when taking your photo. We had lots of fun 'on location' in my garden. Ooh, and there's my latest project (above my head) - a Lyrebird stitchery. You know, I have only ever seen a lyrebird once - very fleetingly - running across the road when on holiday in Victoria......lol! And being Friday afternoon, I will have a little celebratory glass of something bubbly! Today I've been playing with coloured pencils in the studio. These ones are watercolour pencils, just colour in first, then with a little paintbrush dipped in water (with a little fabric medium mixed in), they magically turn into paint - lots of fun. Here is a peek at what I am working on at the moment. This new stitchery - a downloadable PDF pattern, will be available in my Etsy shop soon. Now to get out all of my embroidery cottons and start stitching! A couple of kookaburras dropped by for a dip in the birdbath. and soaking up some sunshine.